The University of Exeter have had a brilliant year. 12 months ago, they fell at the quarter-final stage of the BUCS Championship competition, but they have reacted in the best way possible by reaching Twickenham for the first time in five years. The Green and Whites compete in the Premier South division and after finishing in second place last season, they narrowly missed out on top spot this time around as fellow finalists Hartpury clinched the title. Exeter finished the domestic campaign level on points with Hartpury after nine wins from their 10 fixtures and their only defeat did come against the Gloucestershire outfit back in October. In the knockout stages, Exeter showed their class as they produced a professional display to beat Durham University 22-10 in the quarter-finals before sending out a statement in the last four as they knocked out current holders the University of Edinburgh following a 35-15 win in Scotland. Exeter’s recent record shows exactly why they are one of the most established women’s rugby teams at university level. Since reaching the top division 10 years ago, the south-west outfit have finished no lower than third place in the table and they come into this final having lost just four times in 23 matches. With the current talent Exeter have in their squad which includes the likes of Caity Mattinson, Poppy Leitch and Lagi Tuima, can Jo Yapp’s side taste glory at Twickenham for the first time since 2013? Director of Rugby Jo Yapp: “At the start of the season, we set our goals and that was to be in the top two which we managed to do and we also wanted to go unbeaten at home so we are really happy with how it has gone. Outside Centre Hannah Gascoigne: “I think we wanted to really improve on last season. We wanted to step it up. We were more prepared this season and there was an element for second and third year students that wanted to better what we did last year. Exeter and Bristol Ladies' Clara Nielson: “I think it was a pretty big statement to beat Edinburgh in the semi-finals. We went out very well prepared and we put in our best performance of the season when we needed it. We executed our game plan really well so we are confident that if we play the same way come the final, we will be fine. “It would be great to win at Twickenham! It would mean a lot to both the girls on the pitch and the club as a whole because the 22 that play on the day would not be there without the support of the 2s as well as the support from the staff and coaches." Hartpury went toe to toe with Exeter for the Premier South title this season and after also winning nine of their 10 fixtures, Susie Appleby’s side were crowned champions in their first ever campaign in the top division. They may have ended the term level on points with Exeter, but a stunning ‘Points Difference’ of +674 played a huge part in them sealing the title. Hartpury averaged a total of 77 points in their last five domestic games before clinching two comprehensive wins over Loughborough University (51-5) and Northumbria University (34-7) in the knockouts as women’s rugby in Gloucestershire continues to grow. In 2014, Gloucester-Hartpury Women's RFC was created and this season, we are really seeing the benefits of this combination. Balancing a tilt at the BUCS Championship with a strong challenge in Tyrrells Premier 15s has not been easy, but their hard work and the talent they possess in their squad speaks volumes having reached a Twickenham final and the Premiership play-offs. 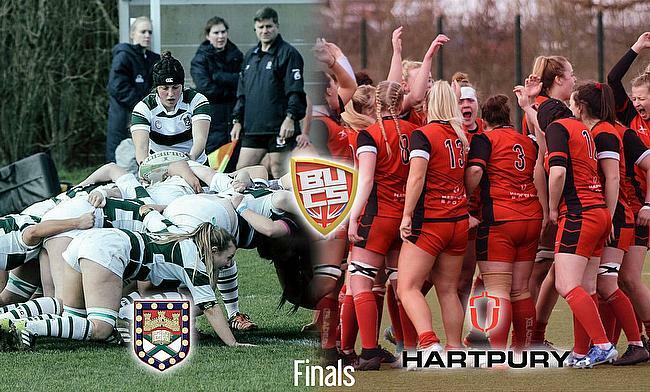 The likes of Sarah Bern, Kelly Smith, Ellie Kildunne and Molly Morrissey are all combining a career as an elite rugby player with a top class degree and couple that together with the rest of their squad, Hartpury may well have the perfect recipe to secure a league and cup double on the university stage this season. Hartpury head coach Susie Appleby: “This season has been an interesting one! The big challenge for us has been managing the players between the BUCS programme and the Tyrrells 15s programme. “Across both the Prem and BUCS, we have really developed as a squad over the last few months because basically, we are brand new in everything. “It has been tough to not over play the players so what it has meant is that a lot of players have been playing university rugby who wouldn’t necessarily have played in the BUCS competition so they have been exposed to that level which has been fantastic. “We now have this exciting opportunity of a final at Twickenham and for some of the players, they have played on that stage before and for some of our other players, this will be a new and special experience for them. “That is why the BUCS competition is really good. Yes, it is great to have some players with international experience which you can use, but actually, it can be about those players who have not played that much rugby before and their development and in terms of some our girls, it has been incredible to see their progress. “We have played Exeter twice this season. We know their players pretty well and they have really good strength in depth across the squad and are a cohesive unit so we are expecting a real battle out there which is exciting. “It would be a dream come true for us to win. We set our stall out with the aim for doing well. We hoped we might get to Twickenham, but we knew there was a lot of decent competition on the way so to have reached the final is fantastic."